By GreenEyedLillies on January 22nd, 2009 . Filed under: Accessories, Baby, Kids . 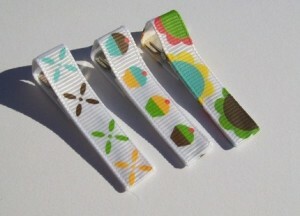 This mod clippie collection is so adorable and great for the upcoming spring/summer seasons! I’ve partially lined 1.75″ single prong alligator clips with various mod printed ribbon. Ends of ribbon have been sealed to prevent fraying. You will receive 1 of each pictured. Matching sets are available upon request. If you need no slip lining added leave the seller a message at checkout. Available at Pretty Heads Boutique.